I was contemplating this week’s Foodie Friday post the other day as I wasted time on the internet. I knew that Todd and I were going to go out for dinner on our anniversary, and I figured I’d just take photos of whichever restaurant we ended up going to. Then, I accidentally stumbled across a bunch of websites criticizing the trend of hipsters taking photos of their meals (such as here and here). Somehow, it never occurred to me that taking pictures of what you eat is an obnoxious trend – I love seeing photos of food, and I couldn’t be a hipster if I tried. I comforted myself by saying “don’t worry, self. This is for a blog post.” Then the realization hit me: taking photos of food for a blog is taking the trend to a whole new level. Not only do you engage in the obnoxious behaviour of photographing your food, you then go on to write about your narcissistic consumption experience. Hmmm. I contemplated this for awhile, but it made me hungry. So I grabbed T-bone and went to Beirut, a Lebanese restaurant in the Thong Lo area. Nothing that a little a lot of garlic can’t solve. Soon, my fears had passed, and I was ready to once again take low quality, low resolution photos of food. Sorry, hipster haters. Our meal started off with an assortment of vegetables and dips that were basically pure garlic cloaked in fat. So good. Choosing our entrees was extremely difficult. I have a bit of a Lebanese food fetish, and Lebanese restaurants are few and far between in Bangkok. There were so many options, and I just knew that I would make the wrong choice and live with gastric regret. 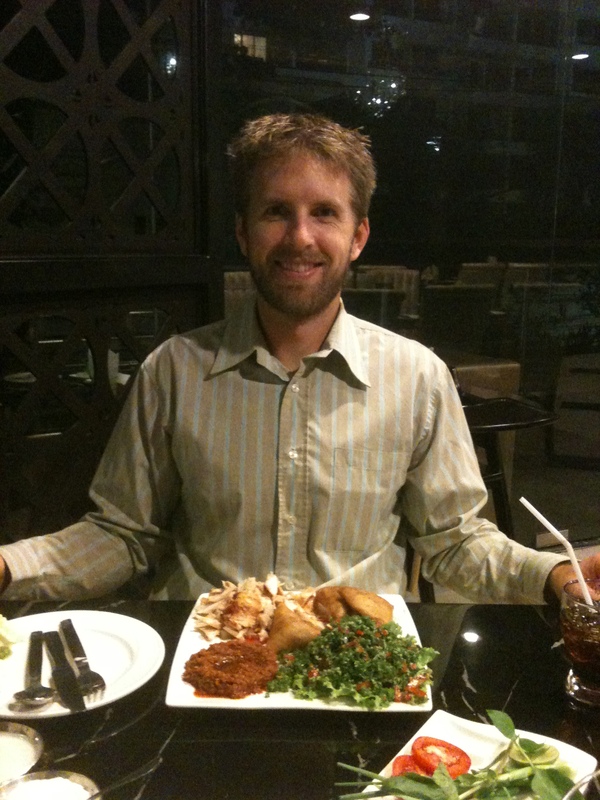 Fortunately, the restaurant had platter options – meals that include four different choices. And fortunately, I knew that I could coerce my husband into sharing with me (“It’s our anniversary, darling. You should celebrate our love by sharing all your food with me.”). Maybe it’s because I hadn’t eaten Lebanese food in such a long time, but our meals tasted amazing. Pure garlic deliciousness. I was basically comatose with food joy. I could hardly speak, which didn’t necessarily make for the most riveting dinner conversation, but it was worth it. We waddled out a few hours later, and we fully intend to visit Beirut again. What do you think? Are people who take photos of food obnoxious? This past weekend, one of Todd’s oldest and dearest friends came to visit us. Todd and Andy have a long and glorious history of doing boneheaded stuff* together, and Todd was very excited to be reunited with his partner in crime. Don’t even bother trying to hide, Andy. The Blog will find you. By the next day, though, Todd couldn’t restrain himself any longer: it was time to celebrate almost 3 decades of friendship by doin’ somethin’ stupid. He hauled Andy to his favourite spot in Bangkok: Taco Lake. Taco Lake is a man-made lake set up for wakeboarding, and it has a t-bar system in the middle – you line up with your board, and clip in when it’s your turn. Taco Lake is the paradise that haunts Todd’s dreams. Unfortunately, I don’t have any photos of their experience to share with you, because they spent the entire time face-planting into the wake, then lining up to face-plant again. *** Andy also managed to twist his ankle, and by the time they finally got home, he was a gimping mess. So we decided it was a good idea to spend the evening dragging him all over the city and feeding him bacteria-laden street food. But not before we made him clean our apartment, as we do with all our guests. First up: we trekked across the city to the river, where we went on a one-hour river cruise in a long-tail boat. This is my favourite type of site seeing – you get to see cool stuff, but you get to avoid the heat/crowds/any type of useful information. Random but very cool buildings. Every time Andy tried to prop up his throbbing ankle on his seat, our rough’n’ready captain screamed at him in Thai. Welcome to Bangkok, Andy. After the boat ride, we squeezed our large farang selves into the non-existent gaps on the train, and headed to Sukhumvit Soi 11. Time for a bowl of mystery noodles in the pleasant 100% humidity of downtown Bangkok. The enthusiasm cannot be contained. These adventures weren’t quite enough to give Andy a complete picture of life in Bangkok, so we pumped him full of ibuprofen and took him to Above Eleven, one of Bangkok’s numerous roof top bars. The photos don’t do it justice, but the views are almost as dizzying as the price of drinks. And a creepily overexposed photo. It’s so rare that I get a normal photo of myself that I had to post it anyway. We finished the night off by getting stranded on the highway when our taxi ran out of gas. Not a problem: we hopped the median and scampered/gimped across four high speed lanes of traffic. And then binged on Magnum bars to ease the trauma. Just another night in Bangkok. Today, Andy flies home. Todd is mourning the loss of his partner in boneheadedness, while Andy is probably finding his long-haul flight surprisingly restful. *Exhibit A: exploring Calgary’s underground sewer system and nearly passing out from noxious gases. **Although their chocolate cake is so revolting that it should be illegal. My subbing job as a Japanese teacher is now entering its fourth week. I’m basically fluent by now. I’ve also been eating loads of Japanese food, so me’n’my gut are pretty much ready to immigrate to the land of raw, dead fish. When I go out for Japanese food, I normally get fixated on the idea of sushi before I even consider other options, but recently, Todd and I decided to give teppanyaki(food cooked on an iron grill) a shot. We were at the mall, and were looking for a quick nosh before we went to watch Oz: The Great and Powerful. * Fortunately, Thais are obsessed with all things Japanese, and there was a teppanyaki fast food joint within plain view of the theatre. It was meant to be. Clearly, this meal will be Xtra fast. And was followed by a plate of bland-looking but super-tasty bean sprouts. Just glistening with delicious fat. Then the animal protein hit the grill, and the chef began throwing around the butter/oil/garlic. Maybe I shouldn’t admit this, but whenever I see chefs use huge quantities of fat, I feel slightly horrified, but simultaneously extremely excited. Ready to shovel that fat onto a plate. I think Todd looks like an anxious dog waiting to chow down. Todd also had some tasty treats, although I think my butter soaked salmon definitely won. Butter beef and butter scallops. Mmmmmmm. Based on their enthusiastic chopsticking, the couple across from us also really dug their meal. And I’m sure they’d be super pumped if they knew they were on my blog. Best of all, the meal happened so fast that we still had enough time to catch our slightly mediocre movie. The anxious dog is 100% satisfied. Just like these puppies on our street. The teppanyaki was pretty darned tasty, and now I can’t decide whether I prefer fish raw or cooked. Maybe I should get my Japanese students to vote.